Joe Herzenberg â€” the first openly gay elected official in the American South, an ardent defender of civil rights and the environment, and the unofficial Mayor of Franklin Street â€” died on October 28, 2007 at UNC Hospital. He was 66 years old. Check out the thread over at OP. 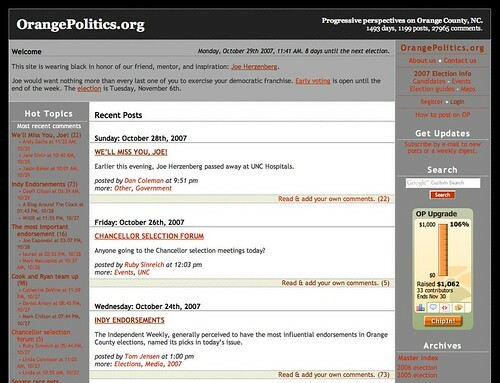 orangepolitics.org/2007/10/well-miss-you-joe/ The comments about Joe are amazing and full of interesting detail. It shows how beautiful and loving our community can be. Previous Post Video: Do schools kill creativity?